After part 1 in Paris, we left for London the day after. 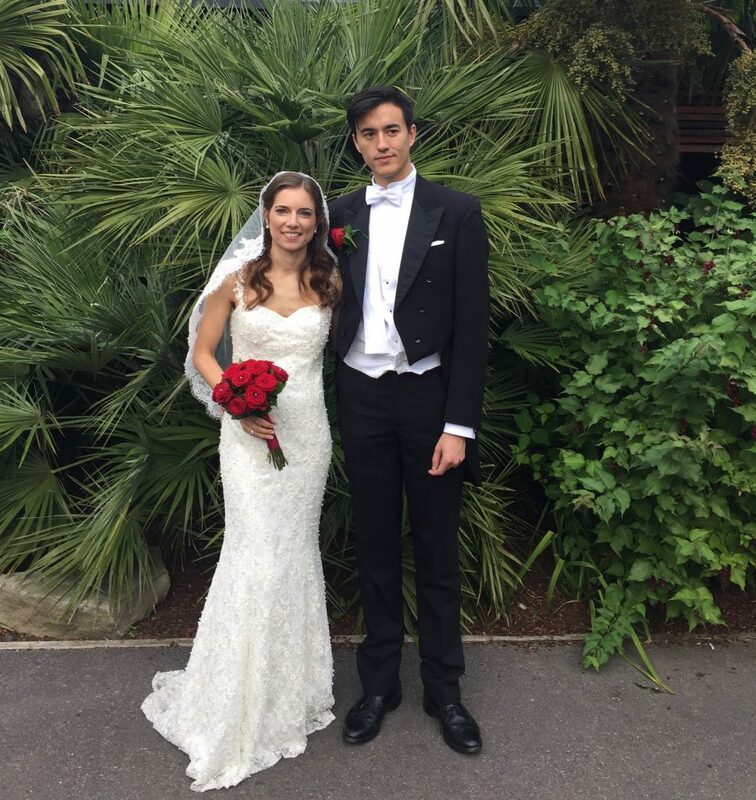 The actual wedding happened on the Saturday though, in a deconsacrated church and then at London zoo ! 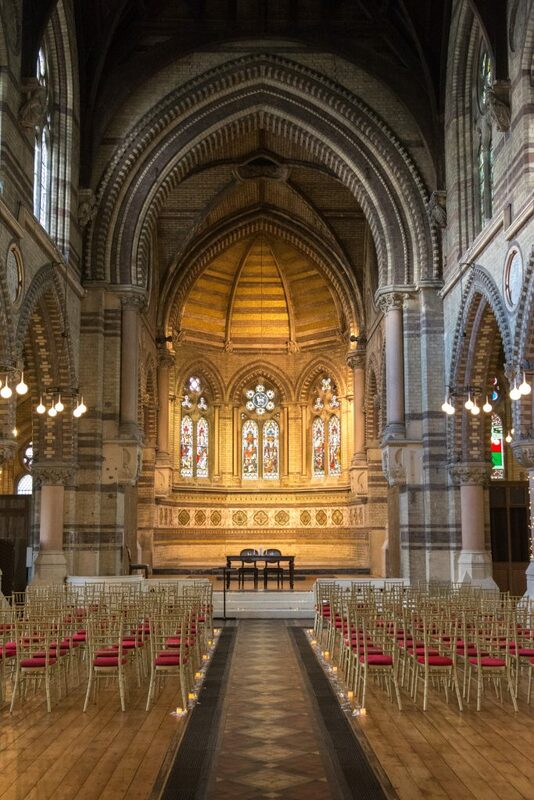 We fell in love with the beautiful St Stephen’s Hampsted, which was booked a year in advance, and we actually set the date only based on their first availability. We wanted the decor to be very simple, candles and rose petals along the aisle and that’s all. We just splurged on chairs, because the church were offering basic church that could be covered with chair covers and organza ribbons, but we felt that hiring more antique looking chairs would actually complete the decor perfectly. We also used the chairs for the reception. 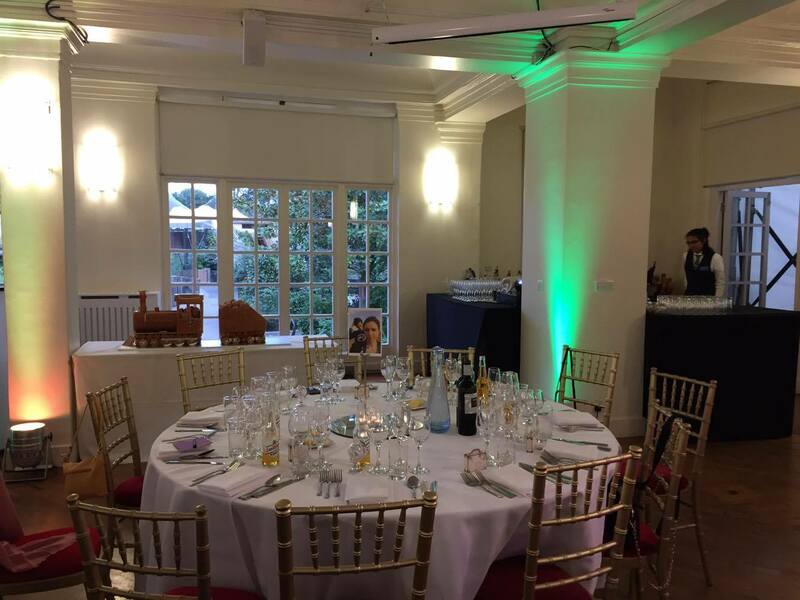 The zoo happens to be one of the less expensive places to get married in London, as they offer a package including room hire, food, service etc. And obviously free entry at the zoo for guests. Many guests said they really enjoyed being able to stroll around the zoo, as sometimes weddings can feel a bit long when you don’t know many people or before the venue opens, while the bride and groom are taking photos. We were happy to feel like they were busy while we were doing that. Of course we loved the idea of being surrounded by animals for that day, but we also like nice buildings and as the zoo is quite old, they have a lovely 1920s pavilion, which made it the perfect place to get married: an elegant and original venue, surrounded by a park. The pavilion is very beautiful with its big windows, so a simple decor with the gold and red chairs was perfect. 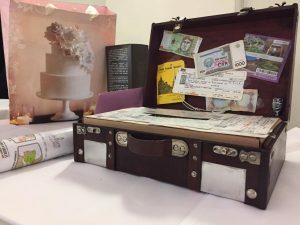 AS we met travelling, the obvious theme for us was… travels. 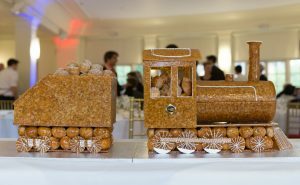 We had a train-shaped croque-en-bouche, and a suitcase gift box covered in Eurostar tickets and travel souvenirs. 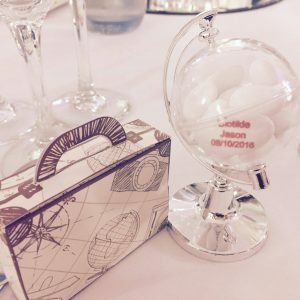 In France there is this tradition to offer each guest a little box filled with sugar coated almonds, called “dragées”, so we used little globes and little suitcases as boxes, which were placed on the tables. The main colour was red, because of course it is the colour of passion, but also reminded us of Russia and China, two countries we travelled around after we met. 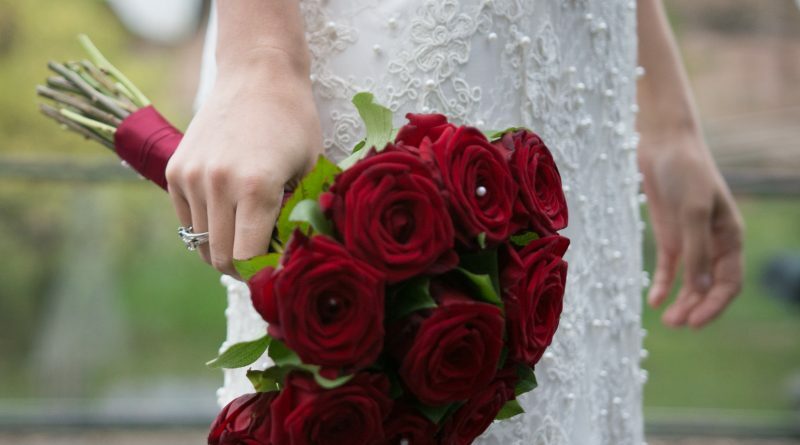 We used red for invitations, the table plan, the ceremony leaflets, flowers and of course seating pads on chairs ! I wanted a backless dress with a heart shaped bustier. As I couldn’t find a dress I really loved, I didn’t see myself spending a fortune on it. I went to hundreds of stores, and I even ordered some dresses on the Internet, bu no one was really perfect for me. 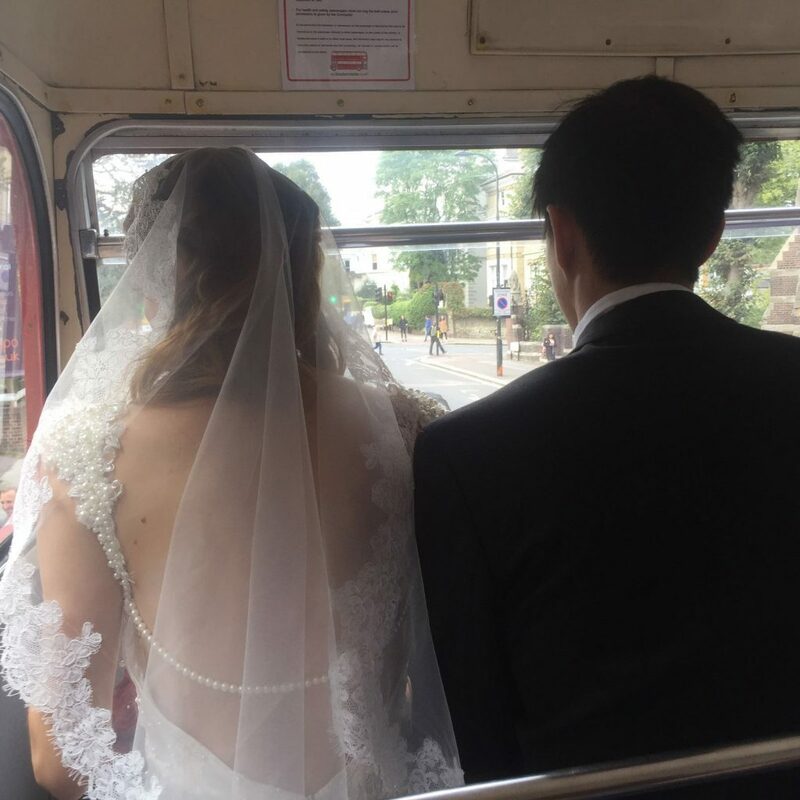 Until I saw a dress in a window, very basic back, but had a heart shaped bustier, was lace and had a pretty original feature I hadn’t seen anywhere: it was covered in pearls. I immedialtely loved it and I knew I could just customise it to make it perfect. I added straps to make it backless, some pearls in the back as well, and that was it ! When it comes to accessories, I bought a vintage veil on Amazon (!!) 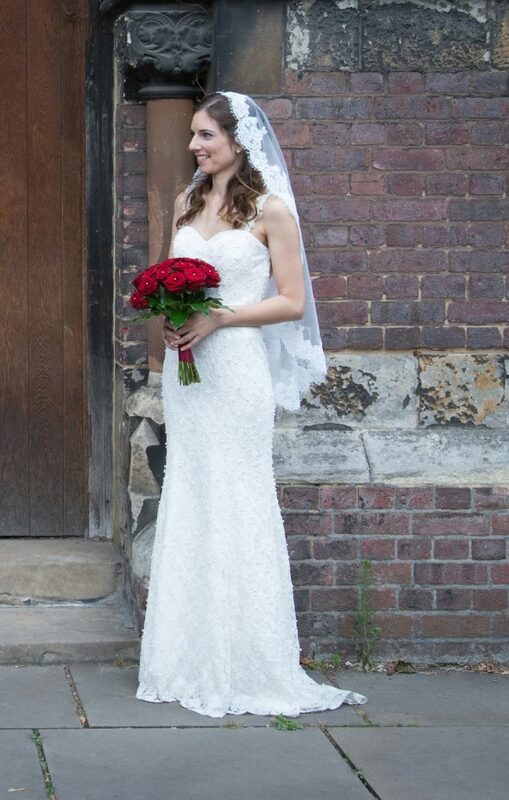 and I wore simple pearl earrings from Tiffany&Co, red Louboutins and I chose a bouquet of red roses, to contrast the ivory ensemble. The groom and groomsmen were wearing a white-tie suit, and my bridesmaids each chose a grey dress. People say that when you see “your” dress for the first time, you know it’s the one, and I think it’s true! I was scared to not find it on time (but who isn’t?) 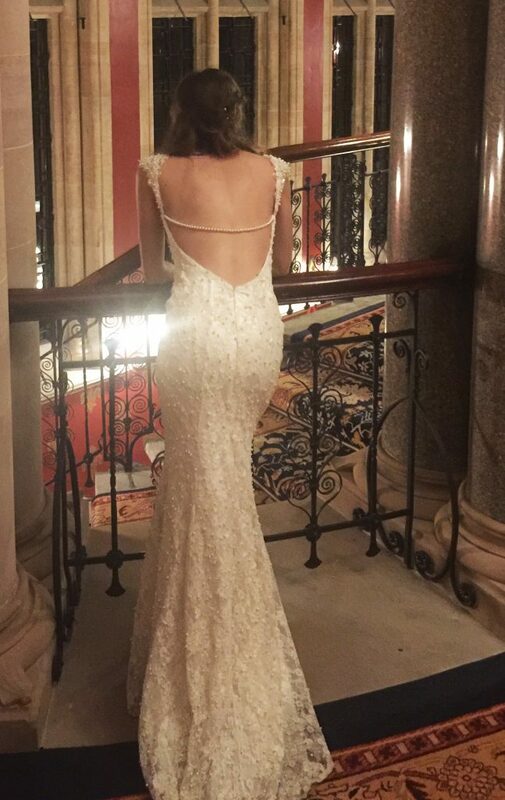 so I ordered very non-satisfying dresses… Anyway, I think if you’re looking for your wedding dress you need to be patient and try second-hand shops or less expensive shop because when if you keep a budget for a tailor, you can actually get a personalised and perfect dress and it’s really worth it.